Afsah, Shakeb, Allen Blackman, Jorge H García and Thomas Sterner. 2013. 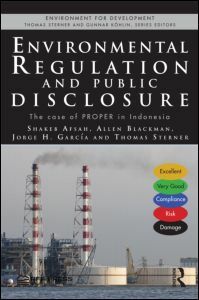 Environmental Regulation and Public Disclosure Published by Routledge RFF Press. This book is a remarkable case study of an environmental policy initiative for a national environmental regulatory system in the information age. In 1995 the Indonesian Ministry of Environment took the bold step to launch an environmental disclosure initiative called the Program for Pollution Control, Evaluation and Rating (PROPER). Under PROPER, environmental performance of companies is mapped into a five-color grading scale – Gold for excellent, Green for very good, Blue for good, Red for non-compliance, and Black for causing environmental damage. These ratings are then publicly disclosed through a formal press conference and posted on the internet. Not only did this simple rating scheme create a major media buzz and enhanced environmental awareness of the general public, but it also unleashed a wide range of performance incentives that showed how markets with environmental information could function in a developing country setting. The authors provide a multidisciplinary analysis of how the PROPER program harnessed the power of public disclosure to abate the problem of industrial pollution. They describe how the program has successfully improved the average environmental compliance rate from close to thrity per cent in 1995 to as high as seventy per cent in 2011. This improvement was driven primarily by information disclosure, which avoided expensive and unpredictable legal enforcement through the court system of Indonesia. The combination of institutional history and detailed economic and analyses sheds light on the role of policy entrepreneurs who laid the foundation for disclosure and transparency, despite the constraints of the Suharto regime. The PROPER program is now internationally recognized and continues to serve as a model for many developing countries.